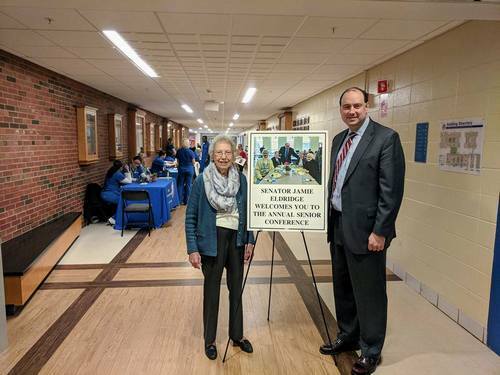 State Senator Jamie Eldridge (D-Acton) today announced details for the 39th annual Senior Conference at Assabet Valley Regional Technical High School Thursday, April 18th. The Senior Conference will feature a variety of services, workshops, food, and entertainment free for seniors in attendance. Senator Eldridge will be joined by Auditor Suzanne Bump, Treasurer Deb Goldberg, Secretary of State Bill Galvin, Assistant Secretary of the Executive Office of Elder Affairs Carole Malone, Marlborough Mayor Arthur G. Vigeant, State Representative Kate Hogan (D-Stow), State Representative Carmine Gentile (D-Sudbury), State Representative Tami Gouveia (D-Acton), Governor’s Council Member Marilyn Devaney, and Superintendent of Assabet Valley Regional Technical High School Ernest F. Houle, among other guests. The annual conference has been a tradition in the Middlesex and Worcester District since 1980, and has been hosted by predecessors of Senator Eldridge’s, such as former Congressman Chet Atkins, former Governor Paul Cellucci, former Secretary of Environmental Affairs Robert Durand, and former State Senator Pam Resor. The event features free coffee, donuts, and a hot, nutritious meal, health screenings, entertainment and door prizes. The conference will feature a variety of interactive workshops that cover a wide scope of topics such as health care, financial planning, fitness activities, nutrition tips, independent living and more. “Aging: planning Considerations for Yourself and Your Parents” with D & G Consulting, Inc. The conference will be held on Thursday, April 18th at Assabet Valley Regional Technical High School located at 215 Fitchburg St, Marlborough, from 8:00 a.m. to 2:30 p.m. The event is free for seniors.